The Netherlands tops the global food index with the best diet. The Netherlands is the number one country in the world for having a nutritious, affordable, and plentiful diet. According to a new food database from Oxfam International, the Dutch diet beats Swiss and French food into second place, partly thanks to its emphasis on dairy produce and vegetables. European countries make up the top 20, aside from Australia, which is in joint eighth place. The U.S., New Zealand, and Canada all come outside the top 20, due to the high rates of obesity and diabetes. African countries make up the bottom 30 places in the table, apart from Laos, Bangladesh, India, and Pakistan, which also feature. 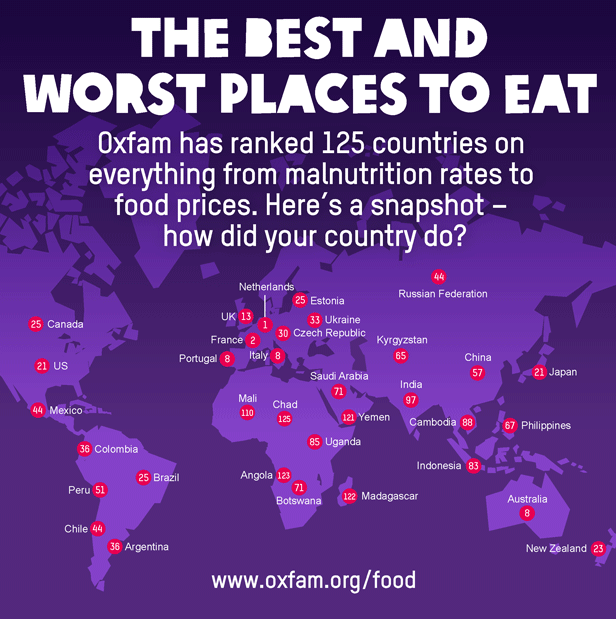 Oxfam’s Good Enough to Eat index looks at 125 countries and the challenges the people there face getting food. The index is based on four categories – whether people have enough food, the quality, affordability, and dietary health. The majority of western European countries performed well in all four categories, however, the UK fell behind on affordability, sharing 20th place with Cyprus. Food in Guinea, The Gambia, Chad and Iran costs people two and a half times more than other consumer goods, making these countries the most expensive for food. The countries which have the highest rates of malnutrition and in which people struggle to get enough food are Burundi, Yemen, India, and Madagascar. Cambodia and Burundi have among the lowest levels of diabetes and obesity. Iceland, with its fish based diet, is awarded a perfect score for quality of its food, in terms of nutritional diversity and access to safe drinking water. It falls down on obesity and diabetes figures, and affordability of food. The Netherlands pushed its rivals off the top spot thanks to comparatively lower diabetes levels and food prices, and its nutritional variety. Obesity levels in the country however, mean the Netherlands doesn’t score as highly as other countries in the health criteria – estimates say 1 in 5 Dutch people have a BMI higher than 30. According to Oxfam International, one in eight people around the world go to bed hungry every night, despite there being enough food to feed everyone. Waste, over-consumption, and misuse of resources are to blame.